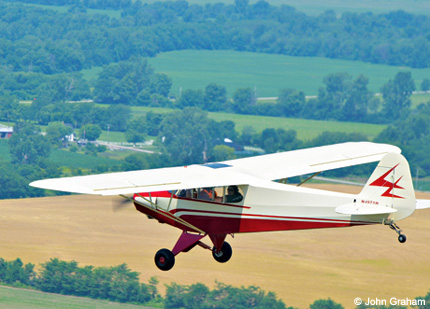 In 1966, teenage brothers Rinker and Kernahan Buck bought an old Piper PA-11 Cub for $300, rebuilt it in their parents' barn in New Jersey, then flew it across the United States in a near-mythic odyssey. Unknown to both at the time, they became the youngest duo to accomplish the feat, and their stops at tiny airports along the way were met with throngs of reporters and well-wishers. Their trip brimmed with treacherous weather, colorful personalities, deserted airstrips and all the adventure one could imagine. Thirty two years later, Rinker—by then a journalist—compiled his memories and notes from the trip, and wrote what has become one of aviation's most endearing books, Flight of Passage. The Bucks' original Cub had endured years of storage in barns and needed extensive fuselage repairs. Nesin kept as much of the original aircraft as possible. More than a book about flying, Flight of Passage is both a coming-of-age story and a touching memoir about Rinker's complex relationship with his father, Tom Buck—himself a pilot from aviation's barnstorming age—and is a slice out of time from Kennedy-era America. Engaging from the first pages when the Buck boys steal away nightly into the barn to rebuild the Cub using pocket money from odd jobs, Rinker's book is a compelling tale of both their aerial adventures (which make it hard to put down once the brothers get airborne) and the exploration of the brothers' attempts to break free from their exacting dreamer of a father. It's the latter that resonates with most readers, and one reason the book is loved by both aviators and regular folk. Look on any pilot's bookshelf, and chances are, you'll find Flight of Passage. Enter Chris Nesin. Chris is a jet pilot for a major fractional operator, but has his feet firmly planted in general aviation. Since 2000, when he fell in love with Piper Cubs after a fellow aviator gave him a copy of Flight of Passage, Chris has immersed himself in Cubs. A pilot since his college days, he purchased a J-3 and flew it all over the East Coast with his wife, April. 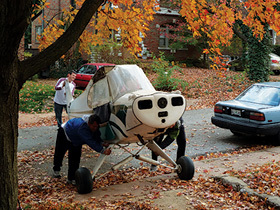 Based in Tennessee, Chris hooked up with the popular supercub.org group on the web and began flying to their events across the country. "I've always had Flight of Passage in the back of my mind," Chris says. "I loved the adventure and the flying, but I also identified with the relationship the brothers had with their father. I had gone through similar experiences with my family, and it resonated with me." One spring afternoon in 2011, Chris had the epiphany that he'd upgrade to a more powerful Cub to continue his own flying adventures. 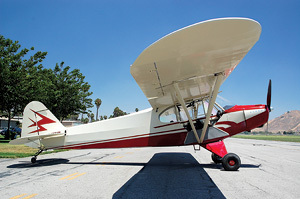 The PA-11 "Special" Cub was his ideal choice. A coincidental (or, as Chris says, destined) email notification from used-aircraft marketplace Barnstormers announced that the 1948 PA-11 Special Cub flown by the Buck brothers in the famous book was up for sale for $25,000 after having been relegated to barn storage by different owners. Chris jumped at the ad, called the owner and bought the historic plane. In a turn that would make every pilot green with envy—and to her everlasting credit—April gave her blessing on the purchase and insisted that Chris also keep his current J-3 Cub. "I hadn't expected that," Chris laughs. The idea of retracing the Bucks' cathartic cross-country journey had been only a seed in the back of Chris' mind. Now that he owned the very Cub that had carried the boys on their flight (N4971H), the idea was cemented to re-create the trip himself. He set out on what would become an almost three-year odyssey of his own to restore the worn PA-11 to its former glory. He would fund the entire project himself, relying on the generosity of many people who donated their labor, wisdom and knowledge. 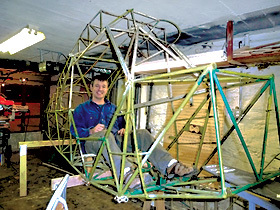 Chris posted his project on supercub.org, and countless people who were fans of Flight of Passage offered their assistance with the rebuild. Companies like Univair and Pierce Aero in Graham, Texas, also lent their support. 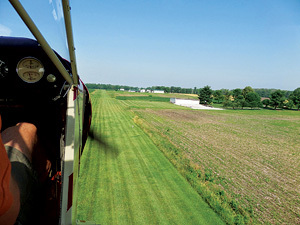 Many of the airports where the Bucks landed are still grass strips. When Chris trucked the Cub home, he found himself staring at a major restoration project. He'd be starting from scratch on the airplane, while keeping it as intact and original as possible. One critical decision was the fuselage. Years of hard landings, imperfect repair and the elements had taken their toll on the steel tubes that made up the Cub's fuselage. There were bad welds, cracks and bent tubes. Chris faced a dilemma: purchase a new fuselage from Univair and start clean or repair the entire fuselage, tube by tube. "I felt like I would be throwing away a bit of history with each piece I replaced," Chris remembers, "so I decided to repair it and replace only what absolutely needed to go." N4971H arrives in California looking exactly as it did in 1966. In June of this year—just days before he was to embark on his cross-country flight—the rebuild was completed. Chris kept everything as original as he could, while bowing to safety and performance. For example, while the Buck brothers didn't have a radio in the Cub, Chris knew he'd be navigating airspace that required communication, so he carried a handheld radio. He also put in a Continental C-90 engine where the original had a C-85. Another big item was the paint scheme. Chris wanted to match the color as closely as possible to the Bucks' paint scheme, but didn't have any color photos to go by, and the Cub had been repainted in different colors over the years. After some research, Chris achieved a remarkable result, settling on a light tan with red trim, just like the original. Along with the rebuild project, Chris worked on planning the flight itself. He and April would follow Rinker and Kern's route as accurately as possible, though neither the starting nor ending airports are around anymore (the Bucks took off from Basking Ridge, N.J., and landed at San Juan Capistrano, Calif.). Of the 30 airports the Bucks stopped at during their journey, several are no longer in existence. First, Chris flew N4971H from his home in Chattanooga, Tenn., to Lock Haven, Penn., to kick off the trip with an appropriate stop at the Sentimental Journey fly-in. From there, he and April traveled to Candlelight Farms Airport (11N) in Sherman, Conn., where they met and flew with both Kern and Rinker Buck. I felt like I would be throwing away a bit of history with each piece I replaced, Chris remembers. "The experience of meeting the Buck brothers was just amazing," Chris says with a wide smile. Rinker and Kern regaled the Nesins with stories about the trip that never made it to the book, and each recounted details about their 1966 flight. As to the restoration of 71H, Kern, who flew most of the legs and was the older of the two brothers, remarked, "I believe this is the finest PA-11 in the world right now with everything Chris has done to it. It's just beautiful." 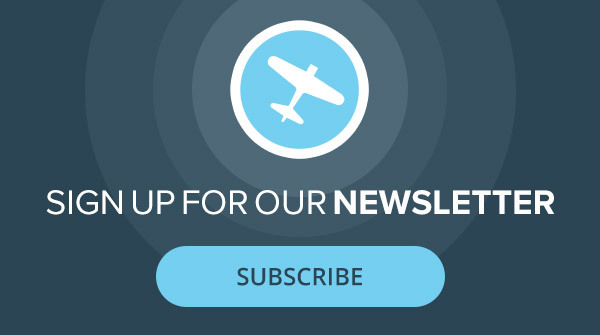 Of meeting Kern and Rinker, April added, "Chris took great care to restore the airplane, not only to make it beautiful, but to preserve as much of its history as possible. It was great to see how much the Buck boys liked the plane and how that impacted Chris, grinning from ear to ear throughout the five hours we were lucky to spend with them." The Nesins launched for California on June 22, 2014. They kept a blog of their experiences during the trip at www.supercub.org/cms. At nearly every stop, the media had alerted folks to the Nesins' flight, and reporters came out to talk about the trip. At many airports, local folks gathered round the Cub, while FBOs offered free fuel, oil or food to the Nesins. "It was so exciting to share 71H with people," Chris says. 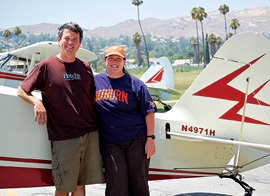 "At one point, in Finleyville, near Pittsburg, we met a sweet couple who had driven 40 minutes to come see the plane." Meanwhile, April, who isn't a pilot and describes herself as somewhat of a nervous flier, was moved by people's reactions to the restored Cub and their re-creation of the book's journey. "There have been so many great people, fans of the book and places over the trip—it's hard to list them all." Where the brothers made the flight in a breakneck five days, flying eight hours a day or more, the Nesins made the flight in 12 days, flying at a more leisurely pace and taking time to enjoy the beautiful landscape passing under the Cub, and speaking with fans at each stop. Chris' mother, Janet Nesin, followed along the route by road in an SUV with a trailer in case the Cub experienced trouble, and to provide a place to eat and rest after each day's flying. They nicknamed the RV "N4971HOTEL" for its accommodations. Janet, along with Chris and April's dog, "Lenny Bruce," would constitute the "ground crew" for the flight, carrying tools and extra parts. Flight of Passage graphics were added to the RV to help promote the flight. The Nesins had different pilot friends from the SuperCub group and fans of the book flying various legs alongside the Cub for moral support. "Without my mother and my friends who flew alongside me, this trip wouldn't have happened," said Chris. "There are so many people to thank that made this journey possible. It was a group effort every step of the way." Retracing the Bucks' famous flight had taken 99.8 hours of flight time, over 7,258 miles, and one month to complete. After experiencing mechanical problems, turbulence, bad weather and the treacherous Guadalupe Pass through the Rockies, Chris and April landed at historic Flabob (RIR) Airport in Southern California on July 3rd, 2014. After a few days in California, Chris dropped April off in San Francisco and flew the Cub back to Chattanooga with his trusty dog Lenny as his only passenger. In total, retracing the Bucks' famous flight had taken 99.8 hours of flight time over 7,258 miles, had crossed 26 states, used 459 gallons of avgas and had taken one month to complete. The odyssey was finally over, 141 landings later. Without knowing it, one of the things Rinker Buck had done when he wrote Flight of Passage was to chronicle the last shining moments of the Golden Age of aviation. It would be just over a decade before deregulation would change the airline industry—and pilot jobs—forever. Liability costs, gas shortages and a recession would cause nearly every general aviation aircraft manufacturer to either close their doors or stop producing airplanes for nearly a decade. Unfettered lawsuits and urban encroachment on airports would soon price aviation out of the realm of two teenagers from rural New Jersey. In that way, the book is a kind of time capsule. 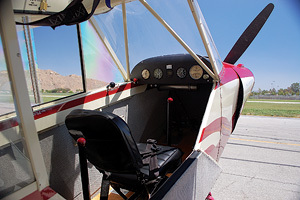 Chris Nesin proved that a cross-country trip could still be made in an old Cub—albeit this time with an iPad, SPOT Tracker, POV cameras and a radio—and that it could still bring rich and memorable experiences. The Bucks' trip west was both a literal and figurative journey away from their childhood and their difficult father. It was a glimpse into a nation enamored with aviation and replete with derelict warbirds rotting in cropduster fields, and crusty "Stearmen Men" hanging on to the last vestiges of aviating as it was in the early days. The America Chris found on his trip was undoubtedly different. But one thing is for sure: There's a happy PA-11 Special Cub sitting in a warm hangar tonight. A veteran now of four coast-to-coast crossings, quite familiar with the North American tapestry passing under its wheels, N4971H endured decades in the corner of barns waiting for its moment to fly again. Thanks to Chris and April Nesin's dream, Rinker and Kern's original Flight of Passage may have been just one stop on a much, much longer journey. Plane & Pilot was fortunate to spend time with Rinker Buck, author of Flight of Passage, to discuss his book, Chris Nesin's retracing of that famous flight and what the experience means to him, nearly 50 years on. Buck lives in Connecticut, and has been busy getting ready for the release of his next book about his covered-wagon trek over the original Oregon Trail. You wrote Flight of Passage 17 years ago. What do you think of it today? Buck: The biggest surprise is that the book inspired people. I didn't set out to write a book that would inspire pilots to do something, I just wanted to write a good book. One that had strong narrative and told a story that I felt was a great piece of Americana. But I got all these letters and emails from people saying the book had inspired them to go across the country in a Cessna or a Maule or a Champ. That was amazing to me, and still is. 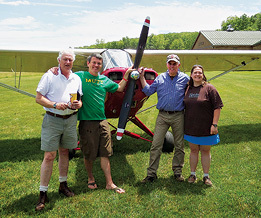 LEFT TO RIGHT: Rinker Buck, Chris Nesin, Kern Buck and April Nesin in Sherman, Conn., seeing the restored Cub for the first time. Why do you think people love your book so much? Buck: Because it's not a flying book—it's a memoir. I didn't want it to be a book about flying—I wanted to write a story that would appeal to anybody with a family, a brother, a complicated father (laughs). Isn't that all of us? Those are the parts in the book people relate to. It's also a memoir about a special time in America, a time that doesn't exist anymore. There was a beautiful simplicity that the book portrayed that people connect with in this world of technology. What did you think of Chris Nesin's retracing of your flight? Buck: I talked about being surprised that my book would inspire people. That Chris and April would use the flight for an amazing cause (the Austin Hatcher Foundation) is moving to me in an incredibly satisfying way. I'm sure I'll be working with the two of them for a long time. It is such an amazing thing for me to know that my book is being used for something like this. You have to understand the enormity of what they have accomplished. To find our original cub and to spend nearly three years restoring it—with the tremendous amount of work that must have been—and to plan and execute this flight today for this pediatric cancer foundation…it's an incredible feeling. What was it like seeing your Cub completely restored? Buck: Chris restored that Cub to such a level of perfection that it is—in every sense—a PA-11 as it was when it rolled off the production line in 1948. The finish and attention to detail is flawless. And he did it with such love and attention to detail. The way he repaired the fuselage, just replacing the damaged steel tubing and leaving the rest intact, was a labor of love. It had been left in the rain for years and was likely in terrible condition. It's especially moving to me. I don't even want to think of how much he spent! Do you think the experience the Nesins' had was similar to yours nearly 50 years ago? Buck: A lot has changed, but the generosity of the American people is still the same. We had people who would hand us a $50 bill and say, "I support your flight," and I'm sure Chris and April saw that, too. But the world we live in today has changed. We're in love with technology, and I have friends who keep telling me how technology helps us stay in touch and all that. But technology has a negative side, too. The simplicity that we had in 1966 was what made our flight special. When I look back and realize that two teenagers navigated an airplane across the country using nothing but pilotage and dead reckoning—without any radios—I'm amazed. It was that innocence and that simplicity that I believe is gone. Buck: I stay current, but I don't fly as often anymore. To me, there's romance in connecting with the land. That's part of what Flight of Passage was about. I was able to have that experience going across the Oregon Trail in a wagon, and I wrote a book about that. I love flying, but it has also become more complicated. In my 20s, I would hop in the plane and just fly around for a while. Today, it's a lot more work to fly. As I've gotten older, I don't enjoy the stress of it (laughs), but I stay current. Your father figured into the book quite a bit. Do you think about the impact of that relationship today? Buck: Yes. As we get older, of course, we become more like our fathers. When I wrote the book, I was a bit embarrassed about that relationship, but my editor pushed me to include more about my dad and, in retrospect, I'm glad I did. As I've gotten older, I realize more how important that relationship is—and that our families and our connections with our families grow deeper with time. I think of him often, and what an amazing, crazy, complex man he was. Of course, my dad was part of the reason we made our flight. You'll have to ask Chris what it is about his relationship with his family that made him take the same flight (laughs). On the surface, Chris and April Nesin's retracing of Rinker Buck's Flight of Passage may seem like an homage to the original book and a chance to restore a historic airplane. But the trip also had another goal: to help raise awareness for the Austin Hatcher Foundation for Pediatric Cancer. "We thought it would just be amazing to partner with the Foundation on this trip," said April Nesin, a pediatric psychologist with the foundation. The foundation's mission is to optimize each affected child's quality of life through specialized intervention programs beginning at the time of diagnosis and continuing until treatment is completed. The Foundation provides services to children with cancer, as well as their families, through its cancer care center, Hatch's House of Hope. The Foundation provides all services at no cost to the families. Services are funded solely by the generous donations of its supporters. April wants people to think about the Foundation's mission when they consider the flight she and Chris have made. "It has been great to share our adventure with all of you and to share our story," she added. "Please reach out to families in your community who have a child with cancer! They likely need more support and for a longer period of time than many of us realize." Learn more at www.hatcherfoundation.org. We have a dual signed book that has a bit of wear because it went the entire trip in our map pocket instead of my own hard back book. I would take it out at every stop to show people and journalists pictures and references from the book. You will not find another dual signed book that went the length of the actual journey in the actual plane. It should be a treasure for a book collector and a fan of the story. 100% goes to the Austin Hatcher Foundation. Find it on eBay.